Question: The graph below shows “The Internet Users” from 2000 to 2009. Describe the graph in 150 words. You should highlight and summarize the information given in the graph. Answer: The graph shows the number of people using the internet from the year 2000 to 2009. The graph, at a glance, shows a tremendous rise of internet users over the years. In 2000, only 0.003 lakh people used the internet. In 2002, this rises to 1.5 lakh which means that in two years’ time 1.497 lakh more people began to use the internet. This trend of growth accelerates further in next years. We find that in 2003, 2.43 lakh people used the internet. After two years, that is in 2005, it becomes 3.00 lakh. Again, if we study the graph we find that the number of people using the internet increases faster between 2005 and 2007. In 2005 the users were 3.00 lakh while it rises to 5.00 lakh in 2007, which means that in two years’ time 2.00 lakh more people began to use ‘internet. However, there is a little increase between 2007 and 2008. 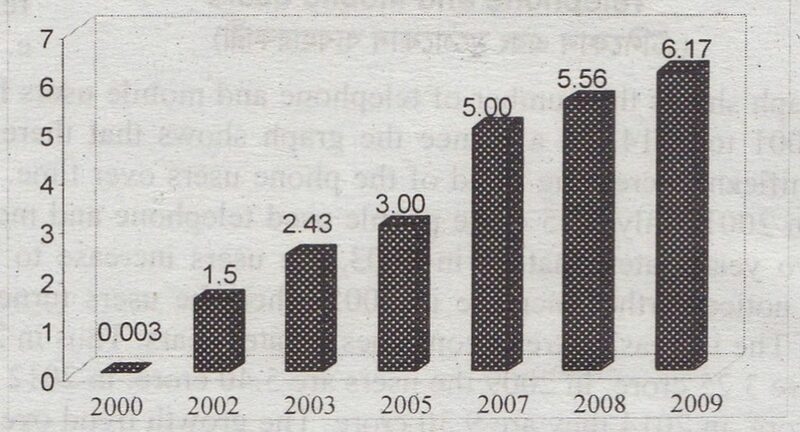 In 2007 it was only 5.00 and in 2008, it rises to 5.56 lakh, that is, a growth of only 0.56 lakh. But from 2008, again the trend of growth goes faster. We find that between 2008 and 2009, there is an increase of 0.61 (6.17-5.56) lakh users. According to the graph we can say, that within a span of nine years the users of interne rise from 0.003 lakh to 6.17 lakh which is really a very significant growth of the users of interne over time.